We first became aware of Tyrant Designs line of pistol grips from our instagram . While we have no first hand experience with these pistol grips they sure do look badass on the right 308 AR, AR 308 and AR-10. We plan on getting our hands on a few over the next few months. The Tyrant Designs AR Pistol Grips install exactly like a standard AR pistol grip. Don’t lose the safety selector detent and spring when removing your old pistol grip. 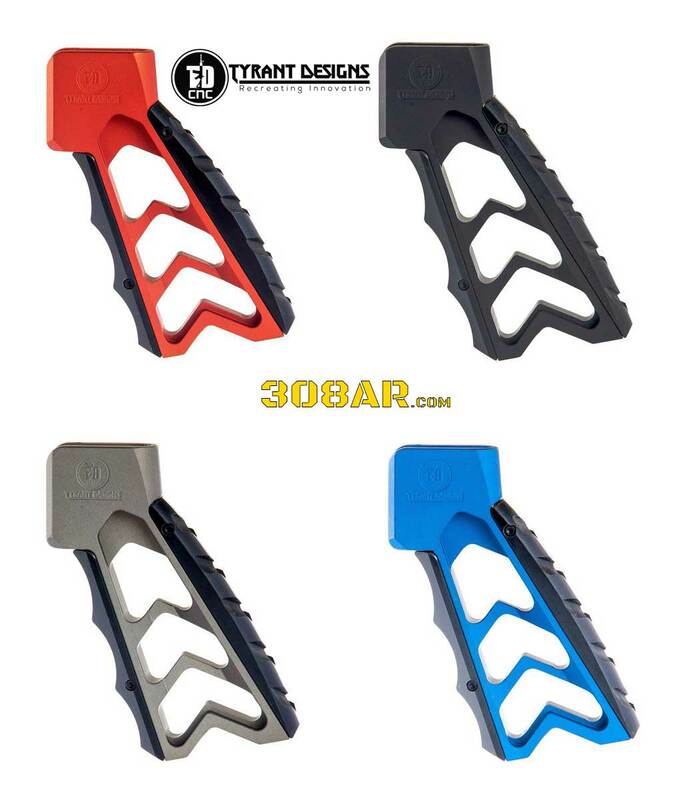 Tyrant Designs LWP Grip or “Light Weight Pro” Series grip is our lightest AR-15 grip yet! Weighing in at a little over 3 ounces it is THE GRIP for a light weight AR build! It is the lightest an all aluminum grip should weigh without compromising structural integrity and durability. A drop in replacement for the AR platform, the Tyrant Designs LWP AR Pistol Grip tips the scales at 3.4 ounces and is lighter than 95% of any other grip. Ever. Period. ( Yes we mean polymers too) ! We set out to create the lightest, most ergonomic grip on the market without compromising the structural integrity and quality. It is CNC machined from a single piece of aerospace grade aluminum and has a knurled back strap for additional adhesion. It instantly gives the operator the confidence needed in any weather or scenario, all while maintaining the consistency needed for a light weight build. It gets bead blasted then finished in a type III hardcoat black anodize. Despite its lightweight it is incredibly durable and does not feel flimsy in the hand. If you are looking for the perfect grip for your lightweight build, look no further than the LWP! Lightweight- Almost 1 oz LIGHTER than a MIAD grip! 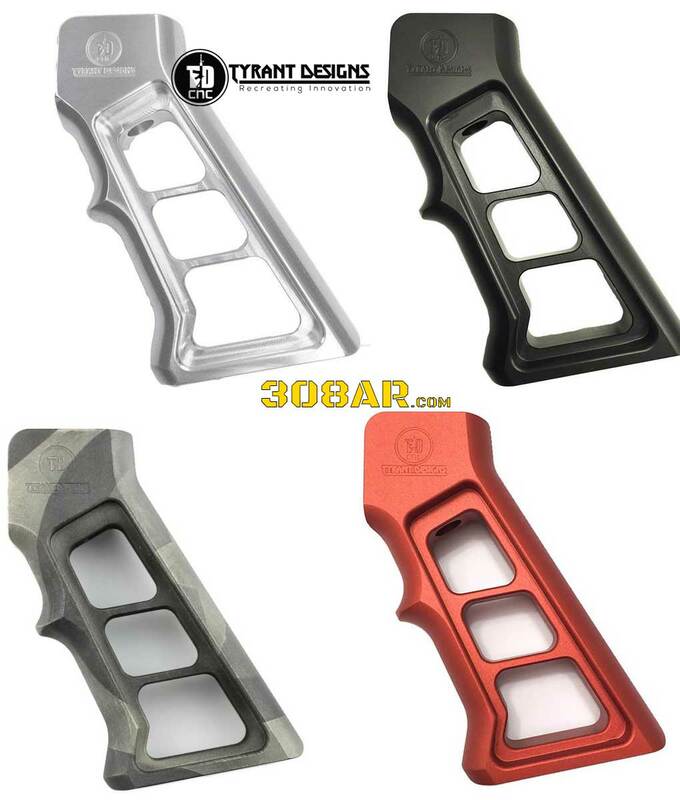 Tyrant Designs Mod Grip is a very lightweight and modular (hence the name) Aluminum and Polymer Composite AR-15 grip. The Body of the grip is made from aerospace grade Aluminum, then finished in a type III hardcoat black anodize. The front and back straps of the grip are made from a polymer composite, are fully removable, and are offered in different sizes as well as designs. The looks of an aluminum grip with the feel of a polymer grip! 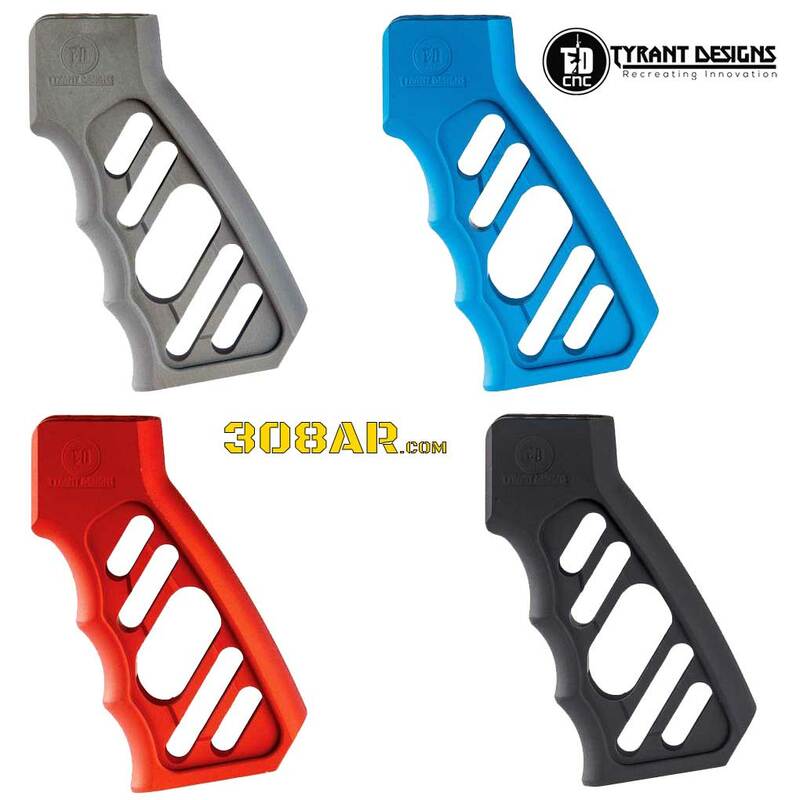 The Tyrant Designs Mod AR Grip is truly the first of its kind. A drop in grip replacement for the AR platform, it has been extensively tested and designed by Tyrant Designs CNC. It is a very lightweight and modular (hence the name) Aluminum and Polymer Composite AR-15 grip. The Body of the grip is made from aerospace grade 7075 Aluminum, then anodized finished. The front and back straps of the grip are made from a polymer composite, are fully removable, and are offered in different sizes as well as designs. We will continue to come out with new strap options as well as strap designs, making this one of the most modular AR-10/15 grips available. With this design the operator will not have to compromise form vs. function. We have specifically designed this grip to feel just as comfortable as any other polymer grip, but with the American craftsmanship every rifle deserves. Please join us in celebrating the MOD Grip and the end of crappy plastic grips! Tyrant Designs Nexus Grip drop-in replacement for the standard AR platform is the lightest aluminum skeletonized AR-15 grip on the market! The Tyrant Designs Nexus AR Grip drop-in replacement grip for the AR platform. It is the lightest aluminum skeletonized AR grip on the market! Not only is it significantly stronger than the average polymer grip, it is lighter than the average grip as well. The Nexus is CNC machined from a single piece of aerospace grade 7075 aluminum and available in Polished aluminum. Its large radius creates a very ergonomic feel, allowing the operator to use for hours on end. The Nexus grip will not crack, chip, fatigue or break…ever. For those who feel their rifle deserves a better quality of grip, the Nexus is the answer. We are proud to announce that your search for the perfect AR-15 grip is over! The Tyrant Designs Titan Grip is an all-aluminum grip. It’s CNC-Machined from a single block of aerospace grade aluminum. The back of the Titan series features knurling for a secure grip in any condition. Despite its high-strength, it’s very lightweight, weighing less than most polymer designs from other companies. 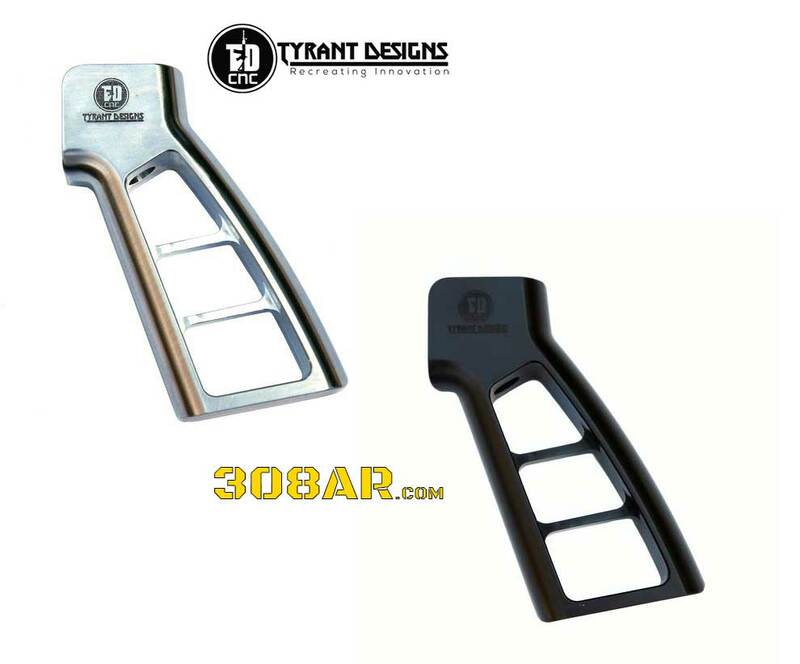 The Tyrant Designs Titan AR Pistol Grip is a upgraded version of one of the finest weapons design by Tyrant Designs CNC. It is a drop-in replacement grip for the AR platform. CNC machined from a single piece of Billet Aluminum and available in hardcoat type III anodized black it has endured 100’s of hours of R&D. A simple screw in installation, it’s time that your rifle looks as good as it shoots!